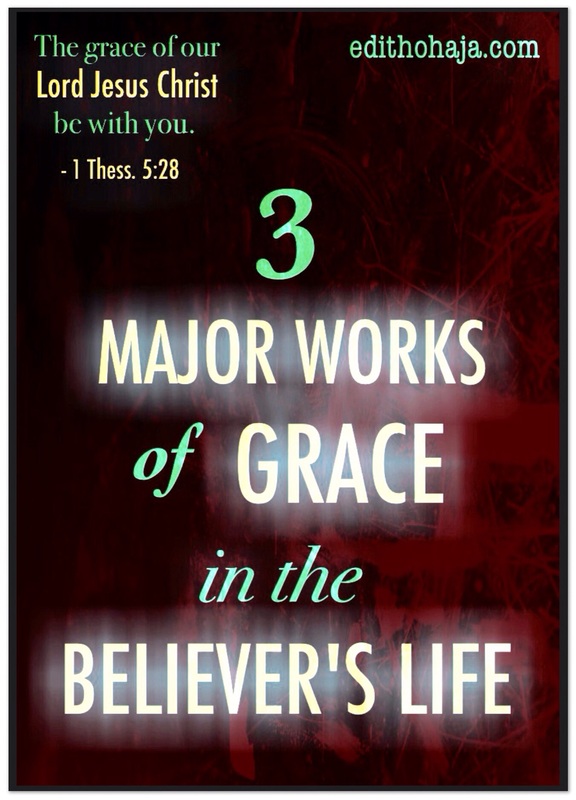 In continuation of our Grace Series, we want to look at the three major works of grace in the believer’s life. We have had two titles in this series. The first explained the meaning of grace, in part, and stressed how it should be reflected in our relations with others. The second was a testimony of grace derived from my interactions with some believers online. You can click’on their titles to read. Without the grace of God, we would still be separated from Him, condemned to die for our sins. That is the first major work of grace in our lives as children of God. “For by grace you have been saved through faith. And this is not your own doing; it is the gift of God” – Ephesians 2:8. “For the grace of God has appeared, bringing salvation for all people” – Titus 2:11. A ransom was needed (one we couldn’t pay) to buy us out from suffering God’s judgment for sin, which is death, and Jesus, the Son of God took our place. “For Christ also suffered once for sins, the righteous for the unrighteous, that he might bring us to God, being put to death in the flesh but made alive in the spirit” – 1 Peter 3:18. 2. We overcome sin and stand firm in trials by grace. So Christ died in our place and we have life, then what? Do we have the liberty to do as we please because His grace covers us and God’s mercy endures forever? Certainly not! The very reason God sent His Son to die for us is that He hates sin and we cannot have fellowship with Him if we persist in sin. Look at the Bible’s descriptions of God through the prophet Habakkuk and King David. “You who are of purer eyes than to see evil and cannot look at wrong” – Habakkuk 1:13a. Being saved does not immediately translate us to heaven physically. We are still in a world that hates God and is full of temptation to do wrong. Grace comes in again and we see its second major work in the Christian’s life. Here is the continuation of the scripture we read earlier from Titus. In fact, we take verse 11 again and go further. We may make mistakes along the way and our God understands our frailties and the stiff contest between our flesh and reborn spirit in its quest to live a life that glorifies Him. Jesus intercedes for us and His indwelling Spirit keeps helping us. “For we do not have a high priest who is unable to sympathize with our weaknesses, but one who in every respect has been tempted as we are, yet without sin. From the foregoing, we see that there is no biblical basis for living in unrepentant sin in the name of grace. This is not a new attraction. Paul adddressed it in the early church. Besides battling with temptations, believers also face trials and persecution. God’s grace helps us to endure and hold on to our faith in the face of these. The Lord Jesus is our greatest example in this. His Passion was a complete work of grace. His flesh shrank from the humiliation and the agony of the Cross as we see in the prayers He prayed in the Garden of Gethsemane but He persevered and drank the bitter cup by grace (Matthew 26:36-44). 3. Grace enables us to do the work of God’s kingdom. As God grants us victory over sin and temptations, and makes us patient in trials by His grace, we see ourselves growing in our faith (James 1:2-4). He then begins to give us responsibilities. We don’t remain babies forever. He sends us to share the gospel, heal the sick, teach and strengthen the saved, etc. But many of the tasks God assigns us cannot be accomplished in our own power or wisdom. In comes the grace again. “Wherefore we receiving a kingdom which cannot be moved, let us have grace, whereby we may serve God acceptably with reverence and godly fear” – Hebrews 12:28 (KJV). In Ephesians 4:7, this is what the apostle Paul said before discussing maturity, spiritual offices and the work of the ministry. “But unto every one of us is given grace according to the measure of the gift of Christ” – Ephesians 4:7 (KJV). The apostle Peter, on his part, described the work of ministry as stewardship of God’s grace. “As each has received a gift, use it to serve one another, as good stewards of God’s varied grace” – 1 Peter 4:10. It is the grace that enables someone to perform miracles and see souls converted, to speak timely words on hidden matters in the lives of strangers and to teach and fortify the faith of the saints. None of it can be accounted for by human skill or knowledge. It goes without saying that if we aspire to see victory over sin, steadfastness in the face of trials and fruit that abides unto eternal life in our ministry, we need to allow God do the first major work of grace in our life. We must accept Jesus as our Lord and Saviour. If you haven’t done that, pray now surrendering to Him so that you can properly begin the journey of faith and enjoy the grace God has abundantly poured forth for us in Christ. The Grace Series will continue with a look at grace in the life of the Apostle Paul. The scriptures used in this study are from the English Standard Version except where otherwise stated. Thank you so much, my brother. While there is time .... You're awesomely blessed in Jesus' name. Our God is merciful but He hates sin. His grace can help us live in a way that is pleasing to Him. Hmmmm! These things you're saying need a megaphone, Collins, don't you think? Keep going and make it louder in Jesus' name. But remember the farmer eats the harvest before others. You are richly blessed in Jesus' name. Thank you for visiting, Chizobam, and for your kind words. May we overflow with grace as we go about our Father's business in Jesus' name. Very true. Thank you, Nneoma! Amen. Where, indeed, shall we be without God's grace? Bless you, Rita! Yes, thank God for His grace. Thanks for sharing! Grace: God's Riches at Christ's Expense. Thank you for a great post! Thank you, Kathleen, for dropping by and for reminding me of that wonderful expression. You are blessed! Oh that we would all embrace grace entirely! Thanks Edith! The word 'Grace' is often teamed with mercy in the Scriptures - and that's such a great teaming! Grace itself is a major part of Who God truly is, and has been defined as: God's undeserved love and favour towards US! That's what Grace is! Praise God! To think that we have that at our disposal always! It's simply awesome! J.C, you need to be born again first of all. You can live above sin in your own power. But when you are saved, the Holy Ghost living in you will help remind you of God's word when temptation comes and give you the strength to resist it. That is how the grace works, my dear! You are indeed and so am I, praise God! Me too! Without His grace, our lives would be: one day, many troubles. Thanks Aunty Edith for this wonderful piece. It brings clarity to the subject of Grace. God's holy nature is still the same yesterday, today and forever. There is never a time He condones sin. His grace is sufficient for us. God bless. Yes, Richard, the availability of God's grace is not a licence for us to relax in sin. You are blessed as well. Thank you for reminding me that I can do all things and overcome trials by the grace of God. Yes, you can! Bless you, Miriam! Amen, my dear! May that grace keep all of us who have put our faith in the Lord Jesus till we appear before the the great white throne in Jesus' name. If salvation was by works and not grace, what filthy Christians we would be! Grace does it all. Clearly understood ma. Is not all about me and my abilities or inabilities. Rather, is all about God who has made His grace available unto us. Glory be to God . Amen! His grace gives us leverage in life. Hallelujah! God's grace will always be sufficient for us Amen..bless you ma. Infact, I would say that the life we are living today, our whole being, is all by the grace of God. He is our all and all. Nice one Ma, keep it up. Grace is pertinent in every one's life. Grace overcomes sin, trials and tribulations and helps us preach the good news of the Lord. Ma, ride on and bombard us with more of the grace teachings. It is important for people like us, the younger generation. lovely article. it really enriches those that read it. The earlier we devote ourselves to him the better. tnk God for his mercy on us. God's grace is ever sufficient. It's a privilege to be living in the time of grace, although most of us abuse it. God's grace is all we truly need in this perilous world. i am a product of Gods grace... God bless you ma. God's grace is a privilege many seek. By His grace, we achieve completeness. Nice write-up Ma. 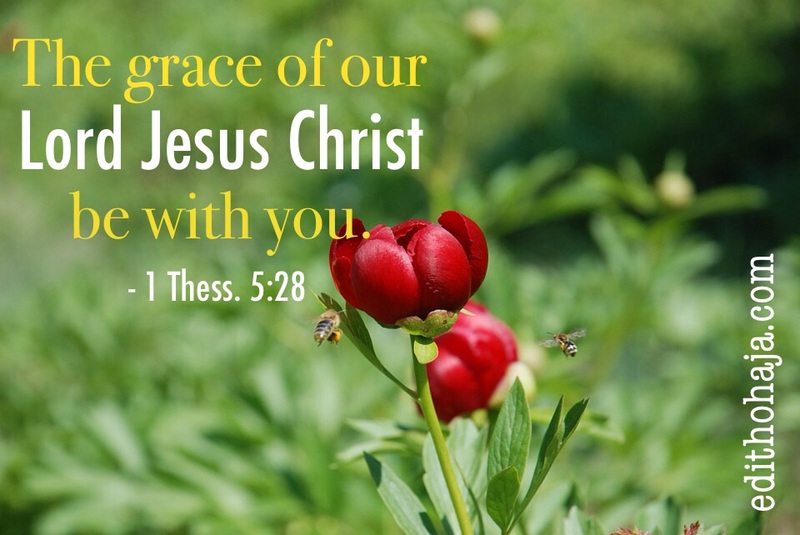 The grace of God is always with us for ever, as long as you believe the working power of the death of our lord Jesus Christ. From my experience as a believer, I have realised that without grace, it is impossible to please God, just like without faith it is impossible to please God. It not a story but a practical truth .it brings clarity to the subject of grace.there is never a time he condones sin. As a believer, without the Grace of God in my life I am nothing. The grace of God is always sufficient. God's grace is what holds any believer.it is our tenet....we are proof of his grace!hallelujah!! Grace to me is God's love towards us. It's God's gift to us. It's God's full work not ours. Just like the Bible says that it's not by our might lest any man should boast. But it's not a liberty to continue in sin but to draw us to his loving nature. Grace is God's endowed love on us that keeps us strong even in times of darkness . God's grace aid us in the course of the work of sanctification. We recognize that many times and in many ways God’s special love is such that he offers us help to live in a way that leads to sharing his life.